As in making lemonade from lemons. 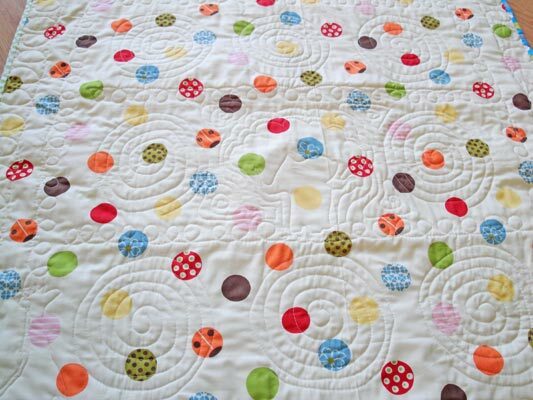 Which suits this quilt perfectly. Because pretty much everything that could go wrong in making this simple quilt did. For whatever reason, I was just not on my game. Long-time friends commissioned me to make a baby quilt as a gift for one of their friends. They asked for something playful and liked the colors blue, green and yellow. I had been wanting to make a hexagon quilt so this was the perfect opportunity. My first mistake was that I didn't have enough fabric of the main print to make 9 hexagons, so I had to figure something else out. 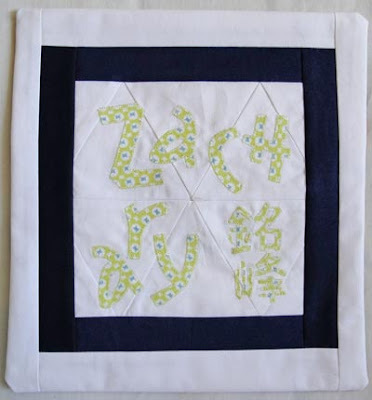 Because my friends had asked that I personalize this quilt for the boy, I thought I would just applique the name in the extra square and be extra fancy and also add the Chinese name. Second mistake. Because the pieces are so small, machine appliqueing the pieces made the texture way too rough for a baby's quilt. 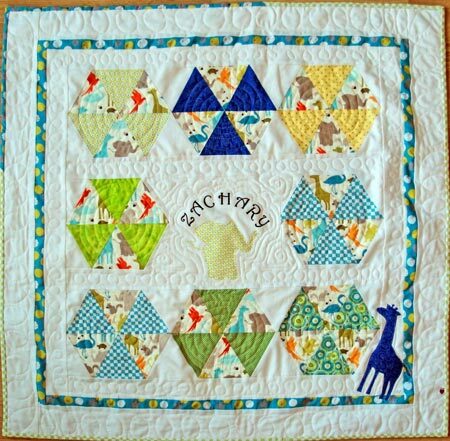 But I had already incorporated the square into the quilt row. Which meant I had to take apart my row and sew in a new square. But I put so much work into designing, cutting out, and then appliqueing the letters that I was loathe to just toss the applique into the trash. So I sat on it and decided to eventually add borders to make the piece big enough for something. Then I sat on it some more and after 3 days figured that I could try to make it into a funky throw pillow. 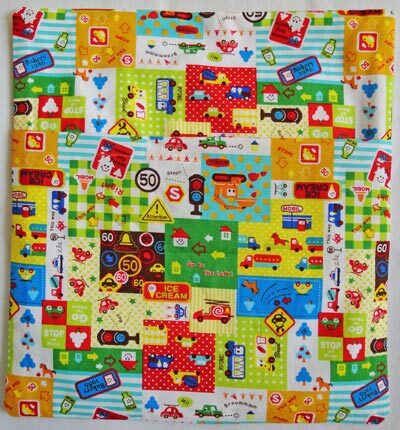 I had some very fun Japanese fabric from the Long Beach quilt show so I cut it up to make an envelope back. I also had to line the appliqued piece to protect the seams and keep them from unraveling in case the putting in and taking out of a pillow insert would rub the seams too roughly. Lemonade out of a lemon. Third mistake. Despite measuring three times before cutting, the square that I had to put in to replace the rejected applique square was too small and the result was too ugly. So out came the seam ripper again. It took me four tries to get the right size square. Too many late nights perhaps? 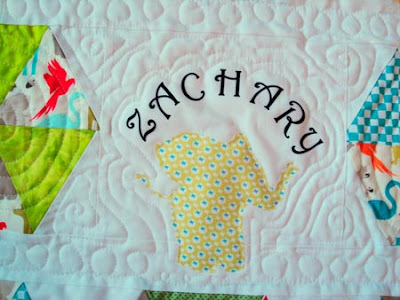 It took me three tries to get the name appliqued correctly. Sheesh. Hooray though for my new sewing machine. Look at how big the space is between the needle and the rest of the machine (aka the "throat"). 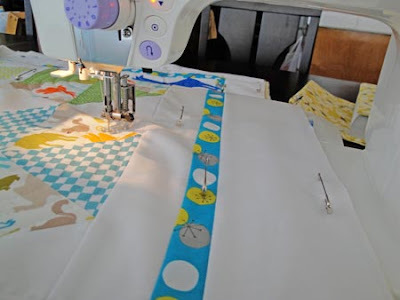 Made all the custom quilting much easier to do. Some close ups of my sketch-like quilting. 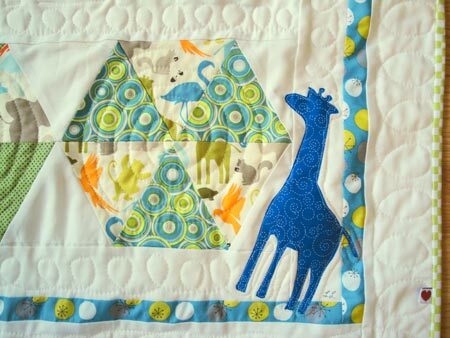 This quilt was a lot of fun to plan and quilt. I hope that it is well-used and well-loved.